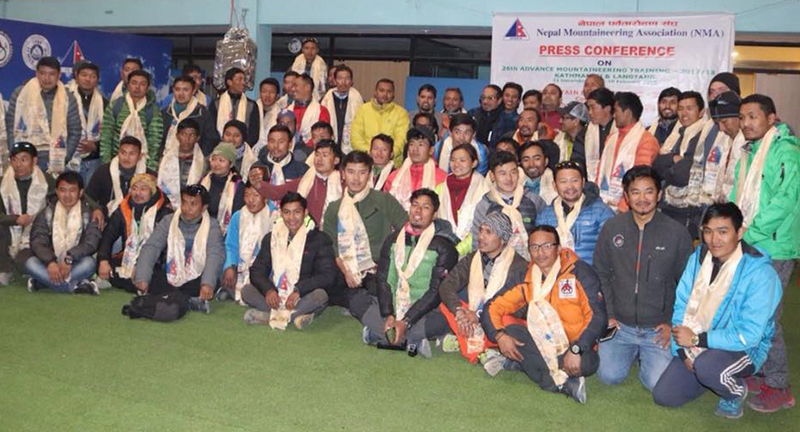 KATHMANDU, Jan 12: The Nepal Mountaineering Association (NMA) is conducting various courses of Mountain Training. Chairman of the NMA, Santa Bir Lama, said that various types of courses for mountain training have been designed for promoting mountain tourism and its long-term sustainable development. The NMA is conducting its 26th Advanced Mountaineering Training, Mountain Leader Course and High Mountain Rescue Training (9HMRT), informed the organization in press conference. General Secretary of NMA, Kul Bahadur Gurung, said that the NMA has been promoting and prioritizing training programs on tourism in order to make the country's overall tourism development more positive and qualitative. Mr Gurung also informed that the documentation of the training and the students will be published in the organization’s website. The 26th Advanced Mountaineering Training, which started from December 31, 2017, will be operated at Kathmandu and Langtang till February 11. Training of 29 trainers who have received basic training in 2016 will be further continued by ten instructors/trainers. Similarly, from January 5th to 18th, 16 trainees will be trained in the Mountain Leader Course, which will take place in Kathmandu and Solukhumbu PK area. There are 3 instructors for the training. There are 15 trainees for High Mountain Rescue Training 9HMRT. Training will begin on January 5th and will complete on January 22nd, 2018. These three training programs have been incorporated by Mr. Tulsing Gurung. While informing about these various types of training, Mr Lama also informed that the plan would further increase the number of trainees and instructors in Nepal.